It’s a sure sign of spring in the Lower Mainland. 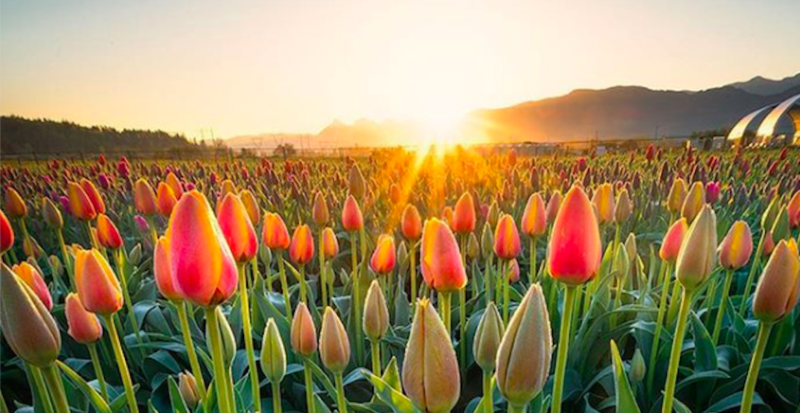 The Abbotsford Tulip Festival is back for another season and the fields are now awash with colour as far as the eye can see. With over 35 different varieties of tulips and 10 acres of breathtaking views, the festival also includes a children’s play area, a flower market, a U-Pick area to take home your very own bouquet, food trucks on site, and games for the whole family to enjoy. The annual event, located at 36737 North Parallel Road in Abbotsford, runs every day 9 am to 7:30 pm, for as long as the blooms last. And if you need even more motivation to go check it out for yourself, here are 37 colourful photos of the festival’s flowery fields this year. Tickets can be purchased online and due to the popularity of the event, advanced purchases are highly recommended. When: April 9, 2018, for as long as the blooms last. Tickets: Available online or at the gate.